Here’s our bikers’ guide to surviving on rural & countryside roads: Like driving in the the urban or the suburban areas it may seem like you have to follow an entirely different set of driving rules (they are pretty much the same, but everything just seems different) plus unfamiliar roads have a tendency to catch riders out. All bikers should conduct routine checks of the important bits of their bike before they set off into the countryside. Remember you don’t need “the right type of bike”, ride what you’ve got. Its amazing how far people have been on learner bikes & mopeds. Longer distance rides can always be broken into lots of small trips if you are worried about your bike overheating or getting stuck in the middle of nowhere. Here are some hints & tips for riding in the countryside. Watch out for tourists, ramblers, Horses, farmers and day trippers. It’s not just bikers who love the countryside – tourism is big business in the county. You need to expect the unexpected where tourist drivers or hikers are concerned. Lots of people travelling through the countryside will be unfamiliar with the roads and you should be on high alert near the many tourist attractions that the county has to offer. Tourist traffic isn’t the only thing you need to watch out for on rural roads – ramblers may be walking in the roadside & there may be no footpath. Tractors, Ramblers, Horses and even lorries are also a familiar sight and they won’t be travelling fast. Be prepared to encounter queues of traffic or people walking with backpacks on seemingly deserted roads – it doesn’t take long for folks to build up behind slow moving vehicles or ramblers. You should also watch out for deposits on the roads left by agricultural vehicles. Keep an eye out for mud, slurry, gravel, oil and diesel & even animal ‘deposits’ as it will all affect the amount of grip available to your tyres. Also remember in the colder months, snow may be on the high ground & some roads perhaps even closed off due to bad weather so monitor the situation carefully. In some areas animals may be grazing at the roadside or in nearby fields so it’s not uncommon to see animals such as sheep or cows wandering across the road, so if you see “deposits” from animals, please be aware loose animals may not be far away & farm animals have no road sense or knowledge of the green cross code. You don’t tend to get settled conditions in the countryside. Be prepared for four seasons in one day. The county’s geography means you can be travelling through brilliant sunshine one minute then find yourself in a shady, steepsided valley the next. This means you should be ready for the road surface to change from dry to damp in just a few moments. The weather changes quickly up in the moors so you should always be prepared for high winds, poor visibility and low temperatures. If you’re staying out all day be aware that you might get dazzled by low sun on your way home. Become an expert at reading the road and spotting biker hazards. Always scan as far ahead as you can. Look for clues in the distance that will tell you what the road is about to do. Signs, lamp posts and hedges can help you read the direction of the road. Ride at a speed that will allow you to slow down and stop within the distance you can see is clear. The right speed will depend on conditions. Watch your speed when it’s wet, foggy or frosty. Also pay attention to the surface of the road. Manhole covers, worn and shiny tarmac, painted surfaces and loose chippings are all things you need to avoid if you can. Be careful when approaching the brow of hill because you don’t know what might be waiting for you on the other side. Position yourself nearer to the kerb than the middle of the road and ease off the throttle. 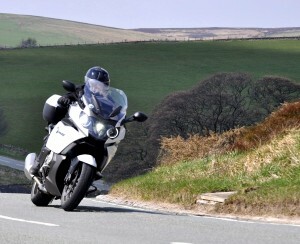 You’ll encounter plenty of bends when riding through the countryside. Always check out the surface of the road when approaching a bend – and adapt your speed and position if you see hazards such as leaves or mud. Roads slope off to the side to help water drain off them. This can help you on lefthand bends but work against you on right-handers. When approaching a bend, check to see if there’s anyone behind you who might be planning an overtake. The best way to negotiate a bend is ‘slow in’ and ‘smooth out’. Remember that bends can look less sharp when viewed from above – don’t let this encourage you to enter too fast. Try to avoid braking in the middle of a bend – it can upset the balance of your bike and could even cause you to lose control. Ride at a speed that will allow you to stop in time if there’s a hazard just out of sight. Lean your machine into the bend with a smooth progressive movement rather than a jerky motion. Apply a balanced throttle as you turn in and your machine settles – enough to keep your speed steady, but not enough to accelerate. Slow down when approaching junctions – that means you’ll be seen in good time by motorists emerging from side roads. Take up your road position in good time so other motorists can see what you’re trying to do. Always glance over your shoulder before making a move – you need to know where other drivers are and what they are doing. When overtaking, stay well back from the driver in front to get a better view of the road ahead. Only overtake if the road is clear and you are confident that you can get past without losing control. Don’t overtake in areas where the central white line that’s closest to you is unbroken. Why not enjoy the ride with a friend, it’s always worth having a wingman with you to help you as he may spot things you can’t. Living in the Countryside is the dream of many. Always ride your own ride, within your own limits. You don’t have to ride fast or you may miss out on the countryside you are travelling through. So what are you rushing for? Also remember you may encounter other bikers many responsible but remember there are a few who appear to be under the delusional impression they are racing at the Isle of Man TT races rather than riding around the tranquil country roads of Staffordshire, so please keep an eye out for bikes who may not be as safe or responsible as you are. Also.. Don’t forget to give other responsible bikers a wave though as you see them, they will usually wave back or wave to you as they approach from the horizon expecting a cheery wave in return as it’s a custom among recreational bikers.